Conferences and workshops are held all over the United States, Canada, and around the world. American Therapeutic Recreation Association (ATRA) hosts one annual conference for Recreational Therapists. These conferences are held in different regions to allow more people to have access to attending them. Last year (2018) their conference was in Grand Rapids, Michigan. This year (2019), the conference is in Reno, Nevada. 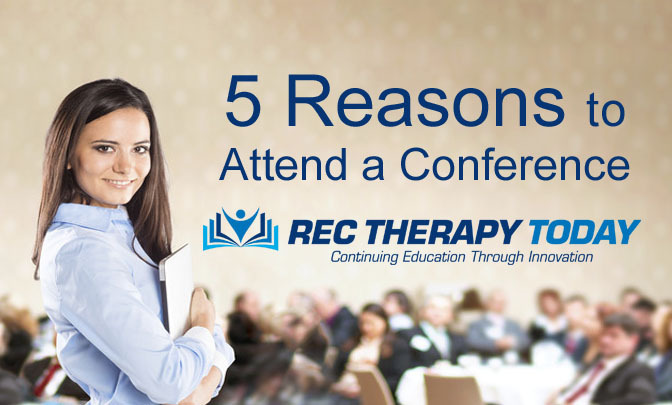 Other professional associations offer conferences that Recreational Therapists could attend as well. State branches of the ATRA host their own annual (and sometimes mid-year) conferences. There are several states that have branches of ATRA. Agencies (like hospitals and treatment centers) host annual conferences that are often specific to their treatment programs. People from many different places attend conferences. Attending a conference is a great place to meet other people who are doing similar work. It is a fun way to share ideas and learn from others. People have found opportunities for career advancement at conferences. People at these conferences might become your new supervisor or working-colleagues. It can be fun to meet up with people you’ve met at conferences at future conferences as well. Workshops and presentations are provided at conferences. There are many learning opportunities. Attending a conference allows a person to learn from people who have extensive experience, knowledge, and skills in specialty areas. Sharing your own knowledge and experiences is possible at conferences. People can submit a session workshop to present. Starting small at a local or state conference might be less stressful before presenting at a national conference. Attending a conference can help you to broaden your horizons. It increases your multicultural experiences. Conferences are held in different cities that each have their own unique history and experiences. You’ll have the chance to get to know people from the area and possibly eat at restaurants unique to that area or visit museums. It isn’t all work. There are opportunities for fun too. Some conferences have a comedian or entertainment sessions programmed. Hotels often have a swimming pool. There are local events that are unique to each city.